This week’s play experts, Artie (4 years), Clyde (2 years) and Kaden (18 months) decided we needed a location close to a café to keep the pesky grown-ups happy, so we returned to a local favourite of ours at the Gowrie shops. 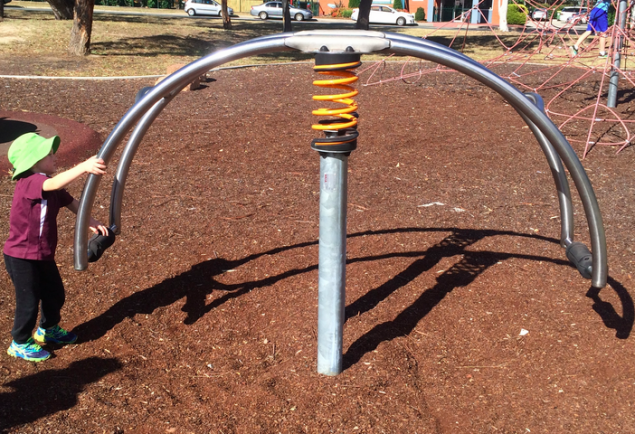 This playground has always been a crowd pleaser for us with a little bit of something for everyone. Armed with our hats and flat whites (for the adults only, of course), we ventured over to the playground. (Please note that the playground is surrounded by a ring-road and experts will need to hold hands to keep grown-ups safe). Clyde and Kaden went straight to the main play equipment area – they love the challenge of climbing up the ladder to the slide and the fireman’s pole. 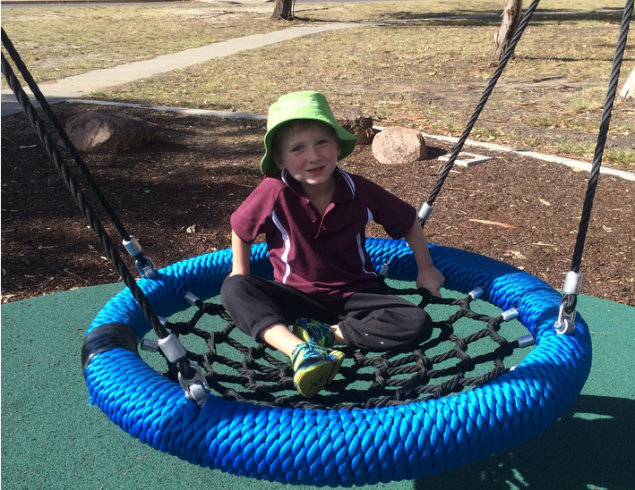 The main play equipment also has two platform areas and semi-circle climbing bars. 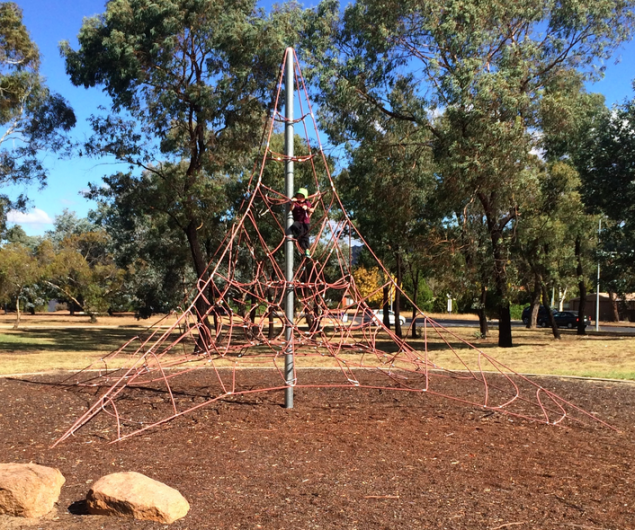 Further in to the playground you’ll find a futuristic looking see-saw, a large spider-web climbing challenge, as well as a bird’s nest wing and a platform turning wheel. Each of these tasks presents a new challenge for gross motor, balance and strength skills. Artie, the master of persistence, thrives on achieving his best on each task and then having the showing the younger boys how it is done. The playground’s location is both a strength and weakness, particularly for those with experts who like to run and explore by themselves. As the park is located at the shops and across from a local school, there is a lot of drive-by traffic as well as cars pulling in and out of parking spaces. This proved to be a challenge with our experts whose little legs carry them quickly and far. If you do need a rest there are plenty of benches placed around the equipment, shaded by established trees and a shade sail. Large bins are a few meters away and toilets are located at the shops, located across the street. The nearby Gowrie shops also provide sustenance for further playing, with an IGA and a local café. As for our final verdict of Gowrie shops playground, we all enjoyed it and will definitely be back again. 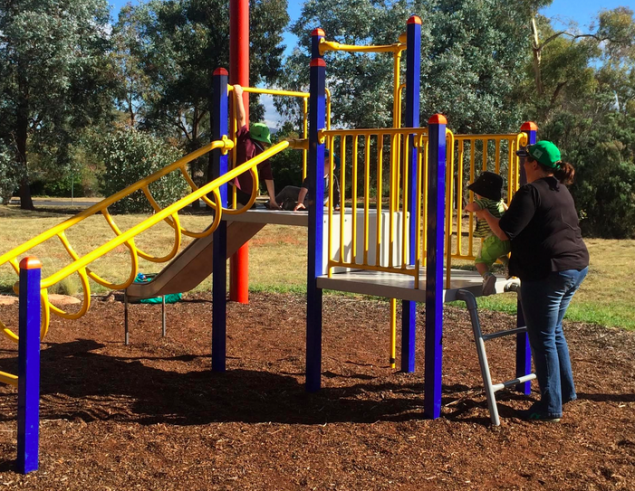 Well located, all recently painted and looking great, this playground is an absolute gem! Parking: Street parking available at the shops or at the school. Recommended for: Play experts and their caffeine fuelled grown-ups, a bit of something for everyone! Children aged 2 – 8 years.